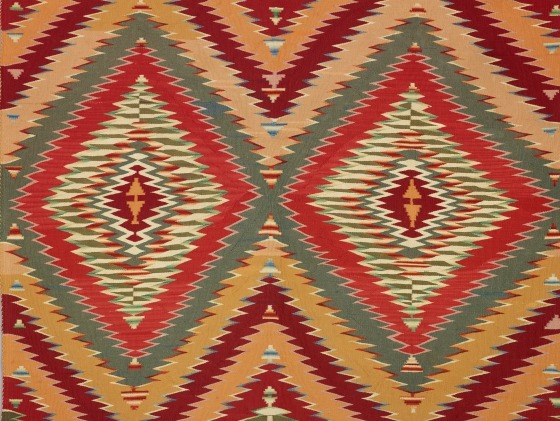 Navajo weaving, performed by women with upright looms, is the most distinguished of modern southwestern textile traditions. 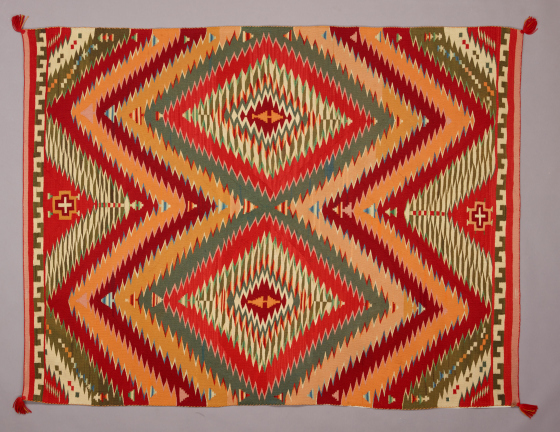 During the 19th century, the wearing blanket of the Classic period (1800–1864/8 CE) evolved into the rug that encouraged the survival of the tradition into the 20th century. Synthetic aniline dyes simplified the process of achieving color and expanded the range of hues, and machine‑spun yarn from Germantown, Pennsylvania, offered consistent diameter and commercial colors. Use of the new yarn in bolder, more complex geometric compositions produced “eye‑dazzlers,” textiles with an intense interaction of color. 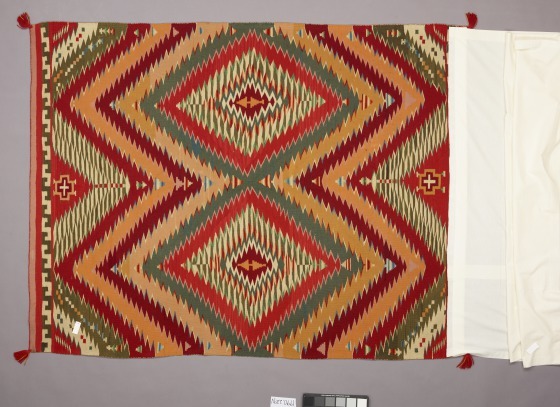 Whether this textile was intended as a blanket or a rug is uncertain. 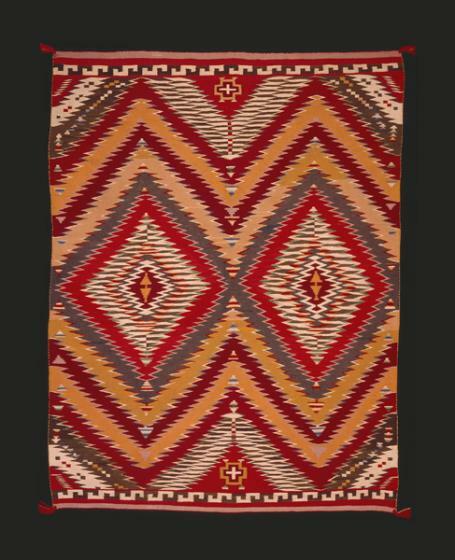 It is larger than most wearing blankets, and the addition of fringe and tassels is unusual, yet it seems too thin to have functioned as a rug. This is a quintessential Transitional period textile—one that might be best described as having been woven as a work of art. 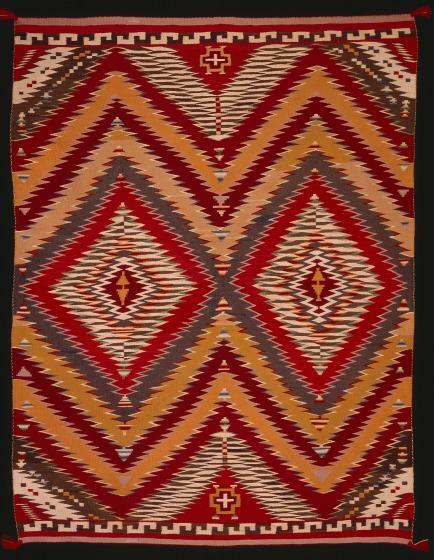 Bonnie Pitman, ed., "Eye-Dazzler Blanket (2008.40)," in Dallas Museum of Art: A Guide to the Collection (New Haven, CT: Yale University Press, 2012), 55. 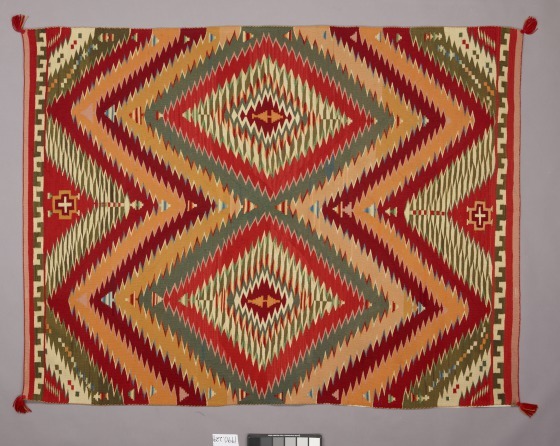 Named on "American Indian and Northwest Coast Top Ten List" (August 6, 1992), Steven A. LeBlanc, former curator at the Southwest Museum at Los Angeles.